Maybe aquarium is too lavish a word to describe where my Marimo lives, but he doesn’t seem to know or care about that. Maximus, as I’ve named him, was living rather contently in his little jar on my desk until late last spring. That’s when the position of the sun shifted in the sky and the morning sun began to shine through the window and hit the desk on the other side of the room. Because I was busy with the Amaryllis bulbs and seed starting I didn’t really pay attention to my Japanese “moss ball” and where it was sitting in relation to the sun. If you’ve ever kept an aquarium you know where this is going, right? Algae! Water and sunlight is a breeding ground for algae and it is mostly unavoidable. One day my Marimo was living contently in his jar and the next day he was covered in algae and it enveloped the inside of the aquarium too. It looked really bad. There is no single cure for algae in aquariums because there are a variety of algae that attack aquariums. I was tempted to get some drops from a pet supply store then I remembered that Marimos are actually fresh water algae, Cladophora aegagropila, and that any chemical treatment might also affected Maximus. So I did the only other thing I could think of and moved the Marimo to the hallway outside my room where very little natural light would reach it. Since the high light level was causing the buildup of brown algae in the aquarium, I figured if I starved it the brown algae would die and Maximus would survive. It has taken a few months of being in a lower light environment and frequent water changes, but it seems like I’ve starved the algae. What you see above is the debris of the algae as it has slowly died, it no longer envelopes Maximus. Although he does look a little worse than when I first posted pictures of him here on the garden blog in 2008. He seems to be on the verge of breaking apart, which isn’t really a problem since they propagate vegetatively by breaking off clumps or when water currents bash them into things like driftwood, vegetation, and stones below water. 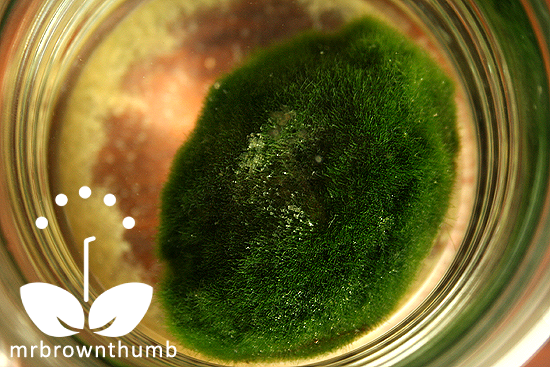 Marimos are mistakenly referred to as “moss balls” but they’re really a species of filamentous algae. If you’re looking for a fun “plant” to add to your indoor garden collection I highly recommend buying and growing a Marimo. They’re interesting little creatures that may not do much at first glance, but once you’ve had one around for a while you’ll see that it is very much a living thing. Sometimes Maximus floats and even in his cramped aquarium he moves around, either inching towards the light from the windows during cloudy days, or away from the light on very bright days. MGT, you constantly amaze me! 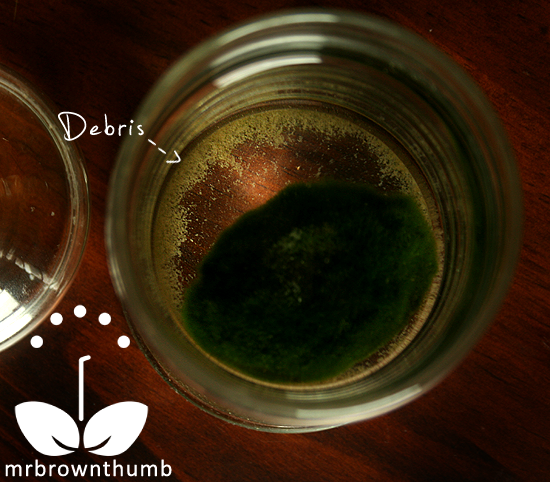 Growing a pet algae - indeed! Glad you caught her attacker before it was too late! What do you mean "may not do much at first glance"? It's so cute! I'd never heard of these, so thanks for schooling me. P.S. Moss balls, snicker snicker. Max is adorable MBT! Glad he recovered from his algae attack. Okay, I have to have one. I can't resist the green fatness. MBT, in your 2008 post you mentioned possibly giving Maximus some liquid nutrients with his water. Did you end up doing that, or does he just abide? That thing is really cool. I didn't see your first post on it. Now I want one. Maximus looks so sophisticated in his jar throne. Now I want a marimo. OMG. Follow you on Twitter, saw this post, now I'm a subscriber... O, yes and I'm getting a moss ball and naming him/her something cool... If that's cool? 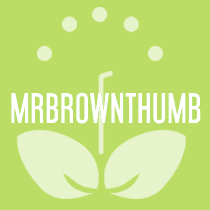 I'm thinking maybe Mr. Brown Thumb, if it's a boy. I like the jar that it's in. Nice! MBT, Leave it to you to have such an unusual "plant!" :-) I probably won't get one, but I hope you post again. I've never really been attracted to keeping plants indoors or plants that aren't useful. But this guy is just so cute! I may have to find one. @webb, Ha. I'm glad I go the attacker too. @Monica, Maybe next time you're in town I'll break off a piece for you since you gifted me that awesome ant-plant. P.S. They also do this cool thing called 'pearling' which are just bubbles that form on them, but I like to think of it as the plant version of purring. @GardenGirl, Thanks, he's recupperating nicely. @Grumblebunny, I did give him a couple of diluted drops of liquid houseplant fertilizer but stopped while I was trying to kill off the other algae. @Kat, You should get one. They're cool plants to have around. @Anthony Young, Now that you point it out, it is rather a posh little thing isn't it? @Meems, I like it too. I'm glad I stopped by the junk store and picked it up. Even without the marimo it's a nice addition to my desk. 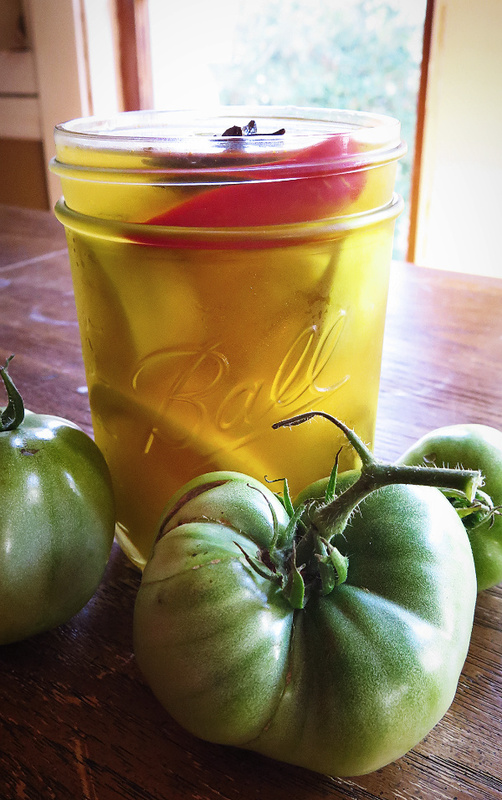 @Dirty Girl Gardening, I stopped by your blog and saw that you have some of your own now. Congrats on the purchase. @Shady, LOL. What? How can you resist this cuteness? @Mud, Aquatic plants are in a different field than "indoor" plants, or at least that's the excuse I tell myself when I get a new aquatic plant. "They're not even houseplants! It is totally ok to buy more." I have a question. I just bought a Marimo and when I looked at it closely and found these tiny white ball/seed looking things inside of it. Do you have any idea what those could be? Hmmm. I don't have any idea what could be. 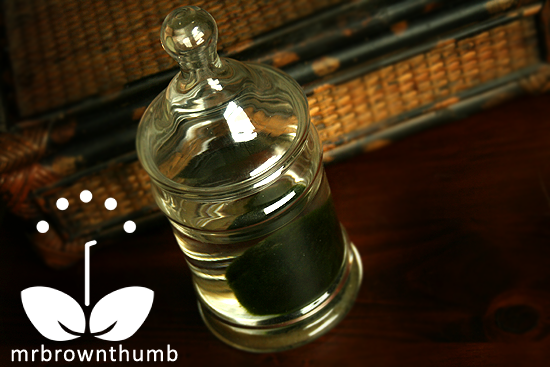 Are you sure you have a "real" Marimo and not one of those styrofoam egg-shaped things cover in fake moss? Or something that's covered in real moss? I've seen those at the pet store too. Mine doesn't seem to have anything inside of it lie that. Hello, where did you buy your marimo? I'm looking to get one, but I want a real one like yours. Dianne, I bought mine from a pet shop in the suburbs of Illinois. It was an independently owned pet shop that has a great selection of fish and aquatic plants and coral. I've seen them in big box pet stores, but those Marimos are "fake." They're ping pong balls covered in moss.